Congratulations to the NJC award winner at the 50th Inorganic Discussion Weekend! This month saw the occasion of the 50th Inorganic Discussion Weekend (IDW) held in Toronto from November 3rd – 5th. The conference was chaired by Dr Bryan Koivisto of Ryerson University and NJC was on-hand to award a poster prize to the best young researcher. 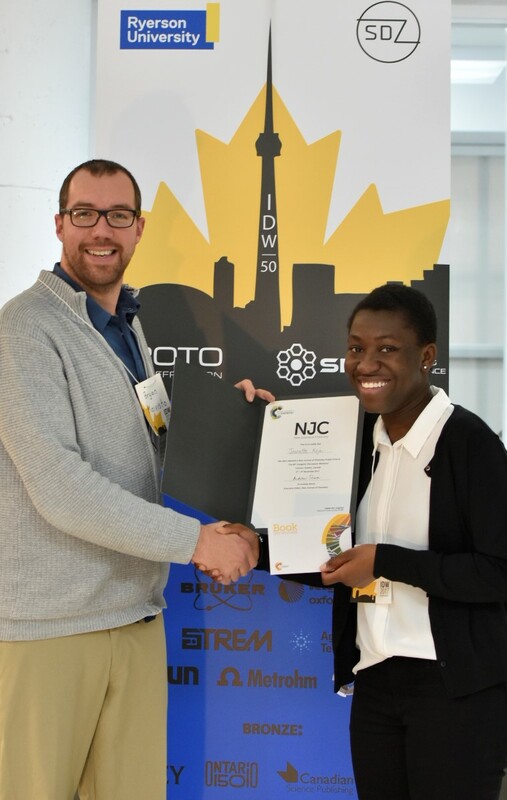 The winner of the NJC Award for Outstanding Poster Presentation was Jeanette Adjei for her poster entitled ‘Nickel & Palladium (N,O)-Donor Ligand Complexes: Structure & Catalysis‘. Jeanette is currently in the final year of her bachelor of science in chemistry at Ryerson University, Canada, and is working her undergraduate thesis under the supervision of Dr. Robert Gossage. Her research focuses on the development of a library of oxazoline ligands and explores coordination chemistry via N,O chelation to nickel and palladium metals. NJC poster prize winner Jeanette Adjei (right) being presented her award by conference chair Dr Bryan Koivisto (left). The IDW is a perennial fall meeting that has become part of the fabric of the Canadian inorganic chemistry community for 50 years. Originally initiated by Dr. Barry Lever (Emeritus, York University & Founding Editor of Coordination Chemistry Reviews) in 1968, this has become one of the biggest regional meetings in Canadian Chemistry. This year it featured internationally renowned keynote speakers Dr Ian Manners (Bristol University, UK), Dr Chris Orvig (University of British Columbia, Canada), Dr Cathleen Crudden (Queen’s University, Canada), and Dr Martin Albrecht (University of Bern, Switzerland). More information can be found at the event website. NJC offers a huge congratulations to Jeanette Adjei for her outstanding poster presentation!